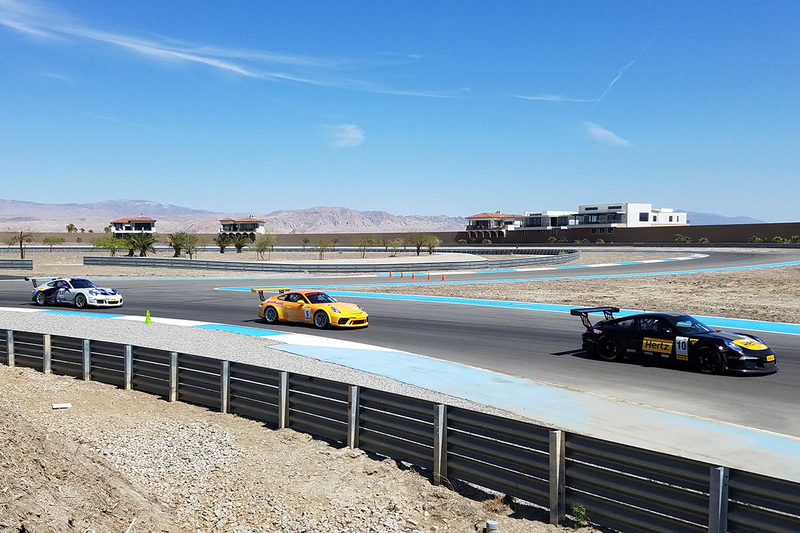 Thermal, Calif. – Sean McAlister and Laura Ely took overall victories in an exciting split-class Race 4 of the 2018 Pirelli Trophy West USA season on the road course at The Thermal Club near Palm Springs. The 21-year-old McAlister, in only his third race in the Platinum Class for first-generation Porsche 991 GT3 Cup Cars, took the victory over the highly capable Porsche 991.2 GT3 Cup Cars, while Ely won the Cayman Clubsport GT4 race handily from pole position. 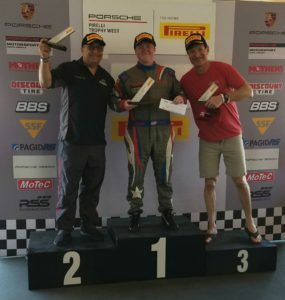 33 cars in five Porsche classes contested the two races this weekend: Diamond and Diamond Masters (2017-2018 991.2 GT3 Cup), Platinum (2015-16 991.1 GT3 Cup), Silver (Cayman Clubsport GT4 MR) and Bronze (2016 Cayman Clubsport GT4 Trophy) classes. 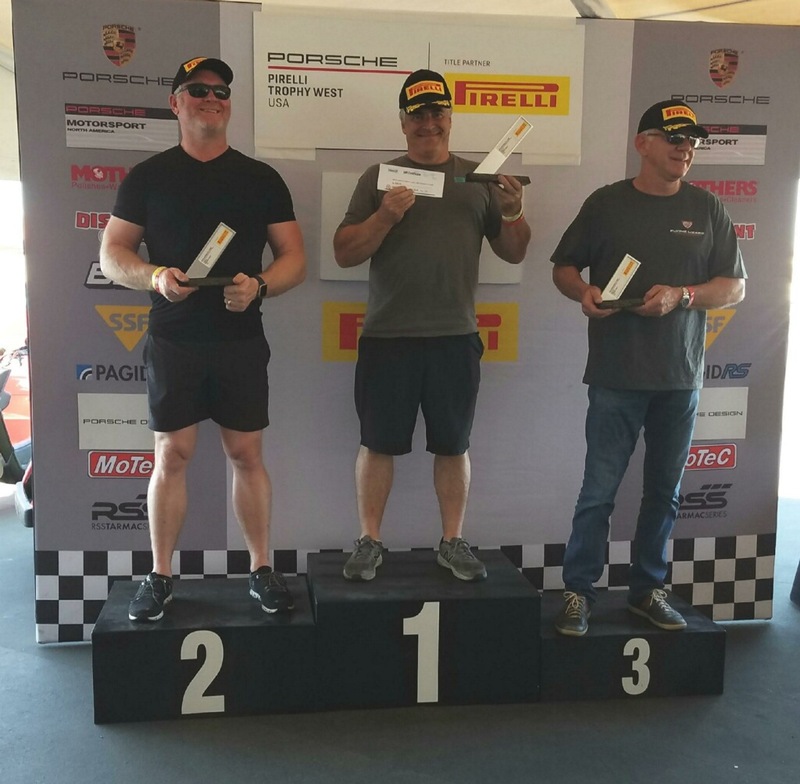 The classes were split into two races, with Diamond, Diamond Masters and Platinum classes in the first race and Silver and Bronze classes in the second around the four-mile, 24-turn GT Track, comprised of elements from the Desert, North Palm and South Palm Circuits. For the second day in a row, temperatures hovered around the 95-degree mark, but with no wind today to relieve the drivers. 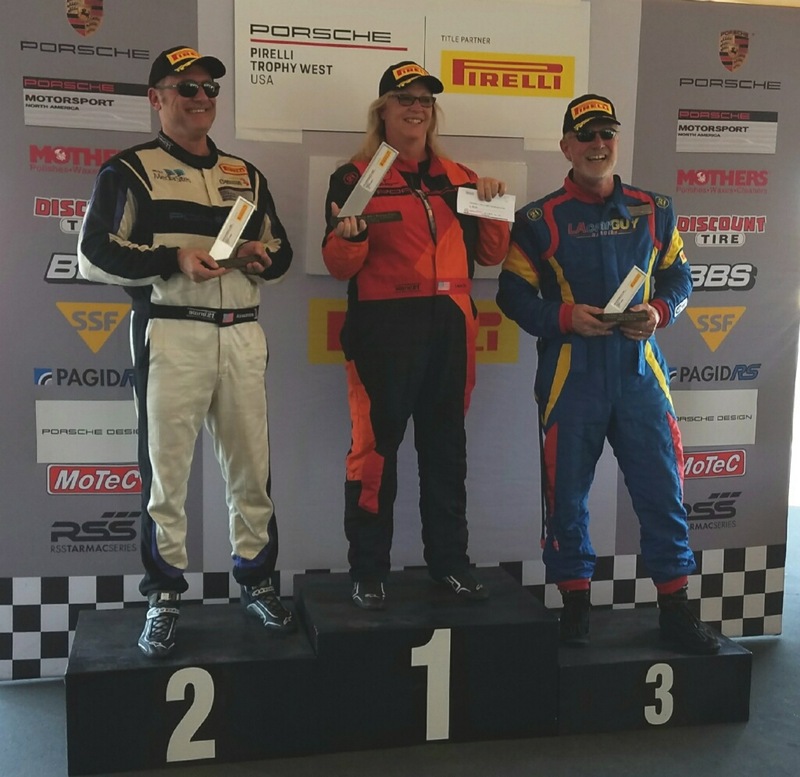 911 Design’s Loren Beggs started on pole, with McAlister second in the No. 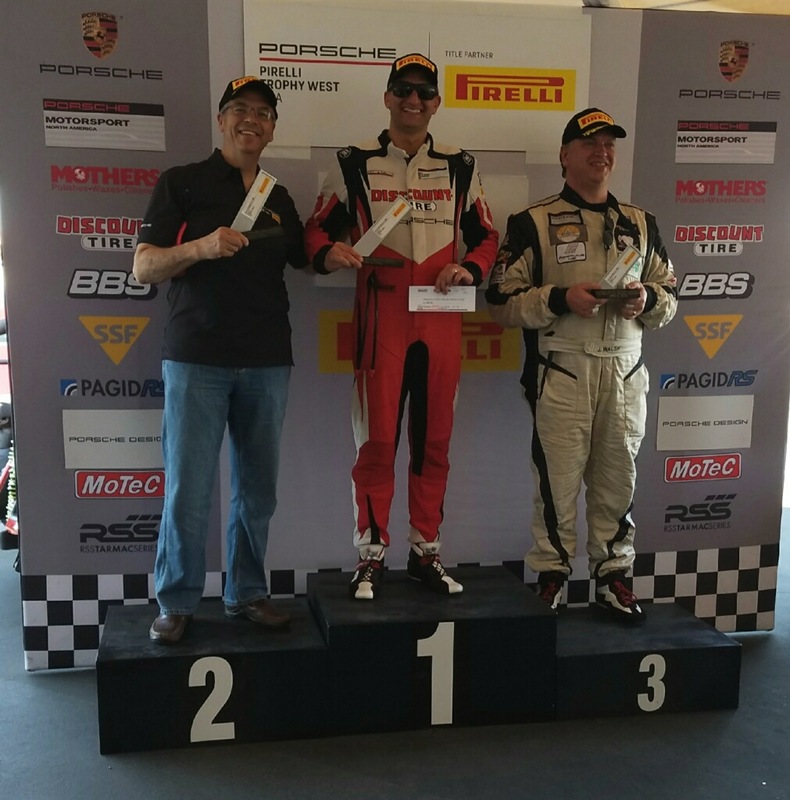 00 Competition Motorsports Porsche and Diamond Masters competitor Michael Zuieback third. Beggs got the jump as the green flag fell, but McAlister found himself back in fourth behind his teammates Zuieback and Preston Calvert. Fighting back through the first lap, McAlister made his way back to Beggs, who was experiencing brake issues. Beggs locked up the brakes in the hairpin on Lap 7 and McAlister made the pass and stayed out in front, taking the checkered flag on the 13-lap, 40-minute flag to flag caution-free race for his first overall victory in the series. 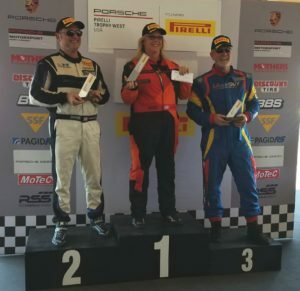 Three classes were represented on the overall podium, with Beggs second (and in the Diamond class lead) and Zuieback third for the Diamond Masters victory. In the GT4 race, Ely took the green flag from pole in the No. 09 Black Sheep Racing Cayman Clubsport GT4 Trophy Porsche and never looked back, increasing her lead to over three seconds. Ely has now split the season’s four races with Competition Motorsports’ Carl Tofflemire, who recovered from an early race off course excursion in Turn 6 to finish third behind Ely and 911 Design’s Alessandro Chiocchetti. Jim Rappaport, driving the No. 72 TRG Cayman Clubsport GT4 MR, was the sole Silver class entrant, as teammate Chris Bellomo sustained damage to his car during qualifying that could not be repaired before the race. Competent Motorsport’s President Greg Franz was thrilled with the weekend’s outcome, especially given the decision last month to move the event from Road America – which was hit with snow this weekend – to the warm and sunny Thermal Club near Palm Springs.